The idea behind this important urban waterscape is that the rainwater should be used where it falls. At Potsdamer Platz, a combination of green and non-green roofs harvest the annual rainfall. Rainwater then flows through the site's buildings and is used for toilet flushing, irrigation, and fire systems. 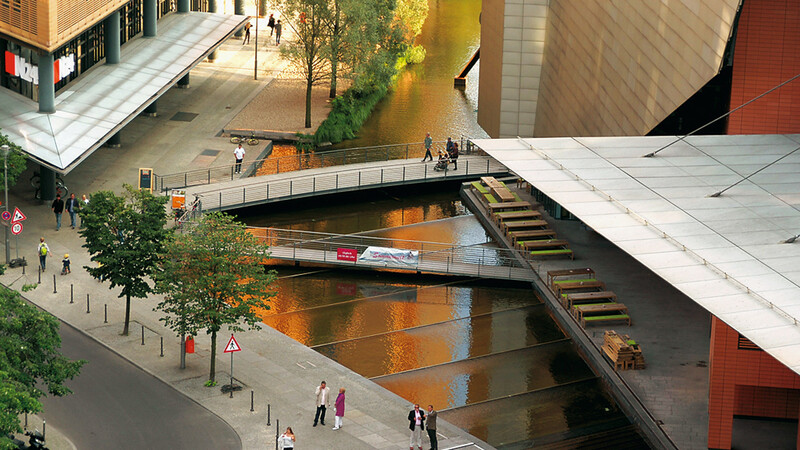 Excess water flows into the pools and canals of the outdoor waterscape creating an oasis for urban life. Vegetated biotopes are integrated into the overland landscape and serve to filter and circulate the water that runs along streets and walkways, all without the use of chemicals. The lake's water quality is excellently forming a natural habitat, and fresh water usage in the buildings has been reduced. Since 1998, Potsdamer Platz has stood as a successful example of a revitalized open space where city life, prestigious architecture, and the beauty of water are in harmony.